What a fantastic card to give to someone! Although this electronic Christmas cards for business design is simple, it says it all. 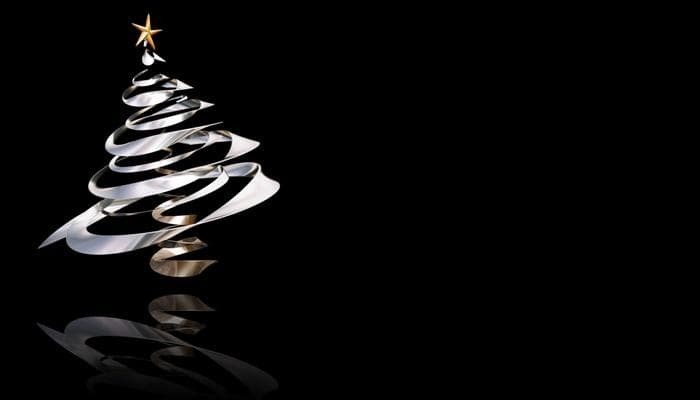 The silver tree against a black background is clearly intended for wishing someone a ‘Merry Christmas’ and it comes across perfectly. The tree is cleverly designed and almost looks like it’s made of steel with a gold star on the top (of course). What a great way of sending your well wishes to someone who’s just as quirky as this ecards without having to send something unoriginal through the post. There are lots of people who would appreciate ecards like this and remember your efforts to include them in your Christmas spirit. Do you have colleagues or clients you would like to send cards to? These corporate Christmas ecards are a great way of personalising your message to individuals to thank them for the year that has passed and wish them happy holidays. There are many more themes to choose from, so if you have a few people on your list, take a look at the rest of the ecards we have available for your business.